Mumbai, 13th November 2018: Hershey India Pvt. Ltd, a part of The Hershey Company, one of the world’s leading snacking giants, is set to foray into the premium, ‘Better For You’ segment in the biscuit category with the launch of Sofit Protein Cookies. Delicious Sofit Protein Cookies is a distinctive product that provides the goodness of protein, omega-3, fibre and vitamins. It has no trans-fat and maida (refined wheat flour). The crunchy cookie is made from multi-grains including wheat, oats, soy and includes ingredients such as flax seeds, almonds, raisins, cocoa and mango. With the launch of tasty protein cookies, Sofit intends to offer today’s health conscious consumer a ‘Better For You’ snacking option. India is a critical part of The Hershey Company’s international business and is one of its focus International markets. Hershey India is focusing on key brands like Hershey’s and Sofit to enter and build relevance across different snacking occasions in the country. Sofit is a clear market leader in the soy milk category. Hershey India’s strategic intent is to drive strong future growth on Sofit by building a `Better For You’ snacking portfolio that spans different categories. The launch of protein cookies aligns with Sofit’s promise of ‘Energy to do More’, by providing dietary nutrients in a delicious range. These ‘Better For You’ cookies will be available in distinct range such as natural cocoa with healthy flax seeds; delicious mango with real almond bits; refreshing raisins with healthy flax seeds. Targeted at working adults residing in the country’s large metro cities, Sofit Protein Cookies will benefit such individuals who are keen on leading a healthy and active lifestyle. 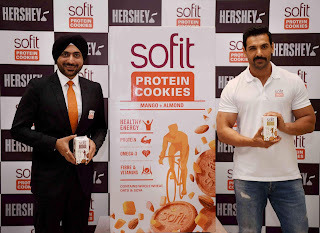 Sofit Protein Cookies will be available in Modern Trade, Large General Trade stores and E-Com in the big cities of the country. The product will be sold at an attractive price point of Rs 45 for the small pack (100g) and Rs 65 for the Take Home Pack (150g).